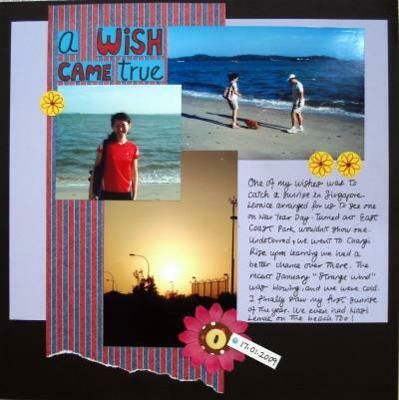 This scrapbooking idea is to share on your scrapbook page, a wish that came true for you. Ah… Don’t fret. It’s not about some big magical wishes that came true. If it is, wonderful! It could be any of your wishes, even if it’s a small one. It’s to highlight about this wish and its process of coming into fruition. For me, I’ve chosen to scrapbook about my wish to see a sunrise. About two months ago, one day while sitting in my good friend’s car, I suddenly asked her and her hubby, when’s the last time they had watched a sunrise. They hesitated for a moment and mentioned about seeing one when they were in Dubai for holiday but had not seen one in our own little country. So I went on to suggest that perhaps it’ll be great if we can go watch one together someday. We didn’t talk about it till one day, my friend asked if I would like to join them to watch a sunrise. We woke up at 4.30am to prepare ourselves. But alas, we didn’t see a sunrise at the venue. We later learned that’s not a good place to see one. More than two weeks later, we made our second attempt, this time at the place where others have told us about. We finally saw the rising sun! Want to know where my inspiration to see a sunrise came from? It’s inspired by the quote below. Very meaningful!